Or, 9-911 from any campus phone. If it is safe to do so, always call 911 or 9-911 in an emergency. If you do not have an emergency, please call 510-215-4858, or on-campus extension 44858. 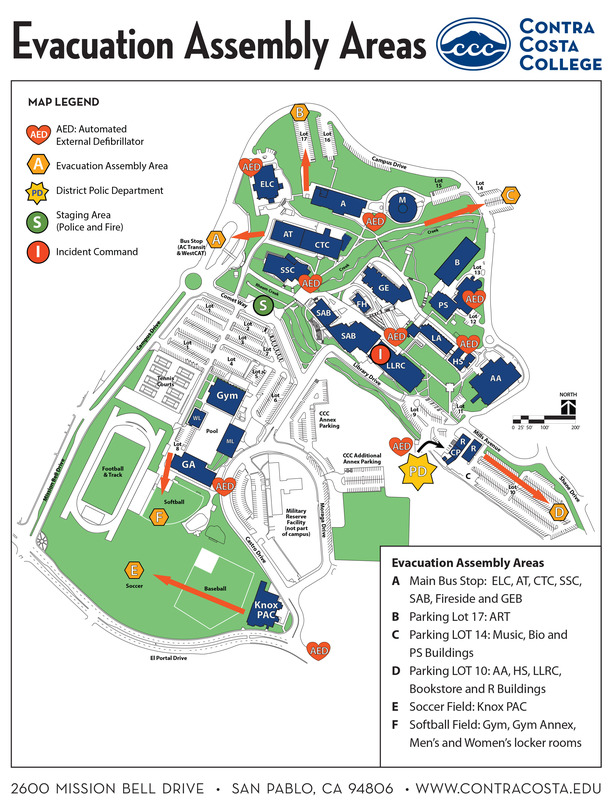 The campus police have prepared a map detailing where to go in the event of a medical emergency, fire, natural disaster. If you require special accommodations, please contact the Dean of Students or Disability Services and ask them who can direct you to these locations. Automatic external defibrillators are located at key points around campus. In case of an event like sudden cardiac arrest, they can check heart rhythm and send an electric shock to try to restore it to normal. Several evacuation assembly areas are also located around campus, in case of fire or another disaster. If you are not injured, please go to these instead of the police and fire staging areas, which are also noted on the maps. Run – With an escape route and plan in mind, leave your belongings behind and run away and attempt to flee the scene. Keep your hands visible so that law enforcement can see you are not the shooter. Hide – Hide in an area out of the shooter’s view. Block entry with a heavy object if possible and remember to silence your phone. Fight – As a last resort, and only if your life is already in immediate danger, attempt to incapacitate the shooter. Throw physical objects and behave aggressively. If you are able to call 911 without alerting the shooter to your presence, do so. Be prepared to give them the location of the shooter or shooters, number of shooters, a physical description, number of weapon in their possession and potential number of victims. When law enforcement responds, be aware that the scene can become confusing. You do not want to impede their search or be mistaken for a shooter. Put down any objects in your hands, including bags and jackets. Raise your hands and spread your fingers. Keep your hands visible at all times. Do not stop to ask officers for help or direction while evacuating. Avoid any quick movements toward the officers and do not attempt to hold them for safety.